I've had several requests for an audio version of my book, More Than Meets the Eye True Stories about Death, Dying, and Afterlife. So, I've decided to create one and the project is currently in progress. I expect it to be ready in about 4 to 6 weeks. Hear a sample now by clicking the arrow in the player below. Purchase paperback on Amazon.com. It's also on Amazon as an e-book for those who have Kindle or Sony Readers. Make the Voices in My Head Stop! Recently, I have heard several parents and a teacher tell about children who hear voices in their heads. The adult’s responses range from being worried about the kids having a mental/emotional disturbance to accepting the child as being psychic and/or clairaudient. I’d like to share those stories as case studies to show how these voices can be eliminated or turned down. Generally speaking, when a child hears voices or sees ghosts, it is usually an indication that he has wandered into the ghost world rather than the ghost actually seeking the child out to taunt him or her. If a child is trying to escape a situation for whatever reason, he may dissociate from present reality and wander into the realm where souls live who have not crossed over after departing from the body. Once a child has tapped into this realm, it is easy to continue to do so even without intending to. It is especially important for empathic children (and adults) to recognize their own vibrational resonance, but many are not able to discern what their own energy feels like enough to know when it has roamed into foreign territory or when their own energy field is being violated. In one case study, a child told his teacher that the voices in his head come and go throughout the day but won’t stay away permanently. When the voices begin screaming, the boy holds his hands over his ears and cries, “The voices! The voices!” His mother told the teacher that this started happening when the boy was two years old. The voices frighten the child but he says he can only make them go away temporarily in his “thinking” (telepathically) not his words. He has described to his mother people who have passed (that he didn’t know prior). One of these is the child’s grandpa (who is deceased) and he tells him to fight the voices. While I’m sure grandpa with his ghostly advice is well meaning, fighting is a form of resistance and will only serve to make the voices worse. By the way, I’m sensing that the grandpa has not crossed over because he feels a need to protect the grandson. The grandpa may be projecting his own fear onto the boy. And, the boy says that he was sent here to protect his mother. Whatever we think about comes about. The universe will allow us to experience or attract more of whatever we focus our energy and attention upon. In this case study, once the voices started harassing this boy, he reacted with fear, which gives the entities the energy they need to continue their activity. Once the boy turned his attention to the voices, he expected them to continue bothering him—and they are happy to comply. Thus, he attracts more of the same. Obviously, this child is in tune with the other side and not just because he is in their territory. He is indeed psychic, and he needs to know how to turn off the voices. He has innocently been serving as a punching bag and laughing stock for ghosts and as a surrogate for his deceased grandpa’s fear, in addition to feeling responsible for his mother’s well-being. Such a huge emotional burden for a young child! All children can be taught to stand in their personal spiritual power to protect themselves from this kind of ghostly nuisance. This is best done by inviting higher vibrating energy such as the Holy Spirit, angels, archangels, and ascended masters into their auric field. Part of the problem here is a lack of education. Unfortunately, most parents teachers, school counselors, and therapists are not trained to deal with psychic children who see ghosts or hear voices. The children of today are psychic like no other generation prior, and we have a responsibility to help them manage their intuitive gifts. As adults, we can’t afford to stand by ignorantly and do nothing while these kids suffer. A child who is taught from a very early age to listen to their internal and higher vibrational guidance and establish a spiritual practice can avoid being bombarded by the negative chatter of the collective consciousness of Earth—that cluttered, confusing field of detrimental energy coming from the chaos of the thoughts and emotions generated by souls (in body and disembodied) on this planet. By recognizing their own divine guidance, kids can immediately know when they are in contact with a voice of one who does not have their best interest at heart. The best thing you can teach a psychic child is that he is more powerful than any earthbound spirit and that ghosts have to adhere to any boundary we set with them. The great news is that all entities can be blocked or removed. However, if we believe that we or our clearing methods are powerless, we will attract the ghost right back to us. This is the law of attraction at work and as you can see, it applies to kids exactly the same way as it does adults. Consistently maintaining energetic boundaries and listening for the kind and loving intuitive voice within us will cause a shift in focus and bring about a pleasant change. No one deserves to have ghostly voices screaming in their heads. As with anything else, you can say no! Teach your children to do the same. In a book that I wrote with Dr. Caron Goode, we discuss how to clear and protect your personal auric field and establish healthy boundaries with entities. While the book is written for energy-sensitive adults, the exercises can be done by any child who needs help shutting off the negative voices in his head. Whose Stuff Is This? Finding Freedom From the Thoughts, Feelings, and Energy of Those Around You (ISBN: 9780982572245), is a guidebook for empathic people who have been unknowingly carrying energetic burdens that belong to someone else. It will help readers learn to sense their own energy and let go of the bits and pieces of psychic clutter that does not belong to them. Learn more at http://whosestuffisthis.com/ . For more information, you might enjoy reading More Than Meets the Eye True Stories about Death, Dying, and Afterlife. My Aunt Kathryn died of lung cancer November a year ago. Before she passed we talked about her visiting me from the afterlife and agreed that our sign that her spirit was near me would be a cameo or silhouette. She lived on Cameo Court when I was a teenager and I loved going to visit her there. Cameos and silhouettes are not often seen these days, which makes them ideal items for this purpose. This past New Year's Eve I was in my office when I started smelling cigarette smoke. I thought it might be Kat so I said hello. Later that day, my husband and I were sitting in the living room when I started smelling cigarette smoke and felt someone playing with my hair. I didn't say anything. I just enjoyed knowing that my aunt was letting me know she was with me. A few minutes later my husband asked, "Do you smell cigarette smoke?" "Do you think your Aunt Kat is here?" he asked. At that moment, I felt a warm energy flow down the left side of my body draping me like a heated blanket, confirming that it was indeed her. So, maybe she couldn't find a cameo! This past weekend I made a trip to Georgia to visit my parents and 94-year-old maternal grandmother, who lives with them. For days after getting back home, I've been thinking about Aunt Kat and wondering how her spirit might be enjoying the afterlife. I also kept craving a cigarette, which is odd since I'm not a smoker and never have been. I love you Aunt Kathryn! Thank you for letting me know you are alive and well in spirit. For more information, you might enjoy reading my book, More Than Meets the Eye True Stories about Death, Dying, and Afterlife. Purchase paperback on Amazon.com. It's also on Amazon as an e-book for those who have Kindle or Sony Readers. I came across a wonderful Website with some very uplifting poetry about death and afterlife. Two poems of particular interest are "We All Are Spirits of Eternal Life" and "We Are Travelers Going Back and Forth Between This World and the Original World." I invite you to check out http://eng.lmr.cc/essence.html to read these beautiful thoughts. As always, you are welcome to comment and interact with one another on this blog by leaving comments. Author Gene Skaggs joins LavendarRose today on We Are One in Spirit Podcast to talk about some comforting messages he received from his son in the afterlife. 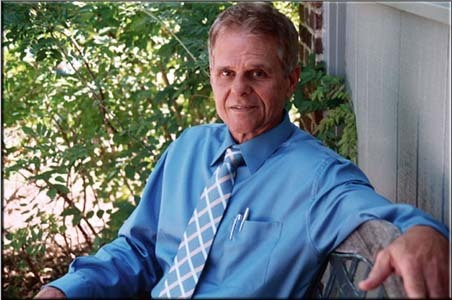 Gene has been a student of A Course in Miracles since 1979, and has written four books on the course titled: A Beginner's Glossary to a Course in Miracles , The Relationship Game Changing the Rules , 101 Questions and Answers on the Course , and Biblical Quotes from the Course Reinterpreted . Gene has been teaching the Course three times a week since 1988. He has a private counseling practice, does numerous talks and workshops throughout the county, and is a certified Psych-K facilitator. 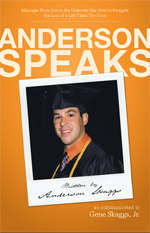 In part one of this two-part interview, Gene discusses his latest book, Anderson Speaks. This book tells a story that began August 6, 2009, when at the age of 22, Gene’s son, Anderson, laid his body down. The next day, Anderson began giving his father numerous messages from the afterlife. The book contains those messages, plus tips on how to navigate the loss of a loved one, how to comfort those who have lost a loved one, stories of who Anderson was while he walked this planet, and messages for his generation. Listen to part one by clicking on the small arrow in the player below. The purpose of religion is to help us find that connection with God that we already (still) have and think we have lost but haven’t. Most religions teach that this connection was lost in the Garden of Eden when Adam and Eve ate the forbidden fruit. The purpose of A Course in Miracles is to deliver us from the erroneous belief in separation that our egos have convinced us is true. It impossible to be separated from God. But there is an illusion that the ego has created that makes us think we are. We are manifesting outwardly what we believe inwardly. Everything we see around us that we are not pleased with is part of our thought system that must be renewed by the Holy Spirit as He removes our wayward thoughts and bring truth to bear on every situation so that our external situation begin to mirror a more positive of who we truly are. When we change our internal thoughts, our world will change as well. Click the small arrow in the player below to listen to part two in which Gene discusses A Course in Miracles and Psych-K. Psych-K gets the unwanted files out of the way so you can experience yourself as one with our Creator. The book can be purchased as paperback or e-book through http://www.geneskaggs.com/ or on Amazon. Also available for Kindle Reader. You can read more about Gene here www.onemiracle.org or www.geneskaggs.com. Sign up for Gene’s itinerary to learn where his next workshop will be: email onemiracle @ comcast dot net. As for the Course broadcast. You might enjoy reading More Than Meets the Eye True Stories about Death, Dying, and Afterlife. Can a Psychic Help You Contact Your Loved Ones? here's nothing that puts the mind at ease better than having all the pieces to the puzzle. But, getting information--especailly from someone who has passed on--is not always easy. Harriette Knight can help. 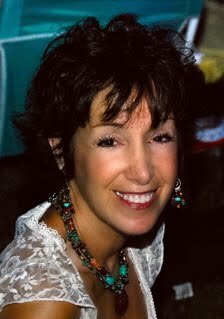 Harriette Knight was my guest on We Are One in Spirit Podcast not too long ago. I think you will enjoy hearing her. She answered a listener question while on the show. She is a master healer, psychic-medium, author, and host of Harriette Knight's Psychic and Healing Hour radio show where she discusses metaphysical topics and answers psychic questions from callers. Her positive outlook on life and intuitive abilities have helped many people learn how to live a fuller and more purposeful life. She is a motivating speaker who through radio interviews, lectures, and workshops helps to enlighten others about their chakras and how to reclaim their personal power through balance and intuition. In part one, we discuss Harriette's healing ministry and How to Fire Up Your Chakras, an online course based on her book CHAKRA POWER! How to Fire Up Your Energy Centers to Live a Fuller Life. This eight-week comprehensive class on www.DailyOM.com includes written material, videos, and audio. It is very affordable--based upon what you can invest. She mentions a book titled The Reconnection ~ Heal Others, Heal Yourself, and I promised to provide a link in case you want to get a copy of it. In Part 2, you will find out what your chakras do, and how they affect every aspect of your life. By following the tips and exercises in Harriette's book you will have the tools you need to become more intuitive, balanced, and fulfilled. This wonderful 120-page handbook is easy to read, interactive, and inspiring. The bonus section "ABALONE TO ZIRCON: The Meanings of the Stones You Wear," reveals definitions of over 50 gemstones, their healing properties, and the chakras they affect. Also included is your very own personal Journal to record your innermost feelings and thoughts. In Part 3 of the show we are going to give psychic readings for our listeners who submitted questions prior to today's show. Listen to Part 3 by clicking the small arrow in the player below. Whether you are a beginner or deep into your spiritual practice, CHAKRA POWER! 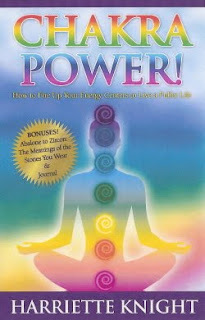 offers numerous tips and tools to fire up your energy centers so you can feel healthier, happier, and more alive! Harriette is also a contributing writer for Scene in SCV where her column "Intuitive Thinking" covers such topics as meditation, psychic phenomena, healing, gemstones, and so much more. When she is not doing healing sessions and readings, Harriette designs a line of healing jewelry for her company, Charity Clarity Jewelry. All the jewelry is one-of-a-kind and infused with healing energy. A portion of the proceeds is donated to charity. There was one question for Julie that I forgot to ask Harriette during our call. Harriette has been kind enough to share her answer as a separate audio below. My new book, WHOSE STUFF IS THIS? Finding Freedom from the Thoughts, Feelings, and Energy of Those Around You, launches with a virtual book tour during the month of March. Anywhere there is a crowd of people, there is abundant energy, both positive and negative. Those who assist with victim protection, do police or detective work, have served in war zones, operate as healers, clergy members, or psychics, have careers at hospitals, clinics, or hospice centers deal with an overload of emotional energy. Many of them feel depleted, overwhelmed, nervous, depressed, or angry; they may feel as though someone is watching or following them; they may hear voices, see shadows, or have a difficult time finding mental or emotional peace. Many of these individuals know that something is not quite “normal” since not everyone is adversely affected by going into public and not everyone picks up on the thoughts, feelings, or pain of those around them to such a degree. They may not know they are carrying or attaching to someone else’s energy, but would love to stop the emotional, physical, and mental turmoil they encounter on a regular basis. For those who experience this type of intuitive or empathic fatigue, Yvonne Perry’s book, WHOSE STUFF IS THIS?, provides spiritual exercises and information to help sensitive people distinguish their personal energy from that of another person; clear their energy field; raise their vibration; shield themselves from detrimental energy; and find relief from emotional storms and empathic fatigue. With a foreword and a chapter contributed by psychotherapist, Dr. Caron B. Goode, ED.D., NCC, DAPA, this book provides a fresh perspective on the psychological aspect of empathy and intuition. “Some of the characteristics that empaths display can also be diagnosed as ADD, agoraphobia, bipolar disorder, or clinical depression,” says Dr. Goode. “Most doctors and counselors are not aware that empathy fatigue exists, much less how to treat it, but this intuitive overload is a very real problem to energy-sensitive people.” Caron is the author of The Art & Science of Coaching Parents, Raising Intuitive Children , and Kids Who See Ghosts - Guide Them Through Their Fears. From February 28 through March 28, Yvonne plans to be a guest on more than twenty blogs where she will post helpful material. From how and why she wrote and published the book, to informative articles on empathy, intuition, spiritual/psychic gifts, and exercises to help energy-sensitive people clear and protect their auric fields, all visitors will read something new each day as they follow the tour from blog to blog. Audio clips, YouTube videos, written interviews, radio interviews, book excerpts, and media releases are also planned in the lineup. Yvonne will be available at each blog for readers to ask questions. See the tour schedule at http://tinyurl.com/EmpathTour. Yvonne is a graduate of American Institute of Holistic Theology where she earned a Bachelor of Science in Metaphysics. For forty years she was enmeshed with the dogma of religion that her family and church leaders passed down to her. Before she had a label for her empathetic ability, she called herself a prayer warrior. While praying for others she took on their suffering until it severely challenged her emotional and physical well-being. Embracing a different path and belief system, she now openly uses the gift of empathy to help others heal their lives. See her full bio at http://weare1inspirit.com. PURCHASE paperback book, Whose Stuff Is This? Finding Freedom from the Thoughts, Feelings,and Energy of Those Around You at http://tinyurl.com/EmpathAmazon. The e-book version is also available for Kindle, iPhone, iPad, and other digital reading devices. Anna Maria Prezio joins LavendarRose on We Are One in Spirit Podcast to discuss why ghosts like to be around humans. Both Anna Maria and LavendarRose are empaths who interact with the spirit world in a loving and non-confrontational manner to create balance and well-being. You will enjoy hearing about some recent visitations LavendarRose had and how she set boundaries to keep one away and spent a few moments chatting with the ghost of a friend who came by to check on her grandson. Anna Maria will talk about how she clears houses of ghosts using feng shui. Anna Maria Prezio, Ph.D., is a Certified Feng Shui Consultant, bestselling author and intuitive. She has studied with a multitude of feng shui masters and metaphysical gurus. She has devoted herself to helping others achieve optimum positive environmental energies. She has done this through hundreds of feng shui audits, readings and consultations on a local, national and international level. 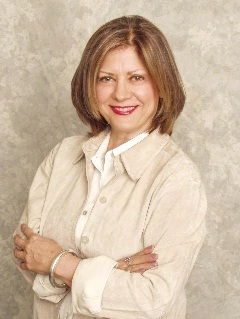 Over many years of feng shui consultations, Anna Maria Prezio was able to make the connection between negative energy and the presence of ghosts in an environment. 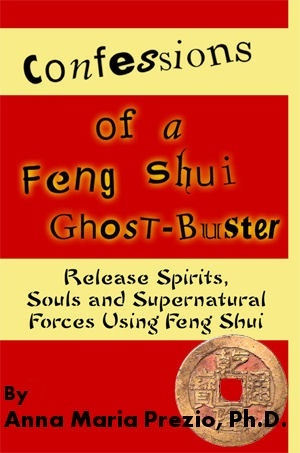 In her book she explain this radical concept in an easy–to-read practical guide on how to apply feng shui principles to ghost-busting. Confessions of a Feng Shui Ghost-Buster is the result of a life-long journey that begins in a tiny village in Italy and has yet to truly end. To help you understand this journey – and benefit from the lessons learned along the way – the book is divided into three parts. Part I will capture your attention with a ghostly first experience of an intuitive and vulnerable 6 year-old child. The culture and experiences of the author growing up in a rural and mystical village in Italy where ghostly occurrences and stories were part of every day life serve to set the stage for what would be a life long study of the mystical and the Divine. Part II describes Feng Shui, like medicine, as both an art and a science. Here, the definitions and different sects of Feng Shui are discussed to provide a backdrop for the connection between environmental balance and the appearance of ghosts. You will learn how mastery of Feng Shui helps us to understand the occult, or hidden knowledge, as it applies to all aspects of our life here on earth. With the formation of a solid foundation and understanding of this art and science, Part III delves deeper into the correlation between environment and entities with ideas, cures and stories about ghost-busting as a result the author’s direct and extraordinary experience. This book – part memoir, part guide – promises to intrigue you from cover to cover. However, the price of admission to this world is an open mind. In return, you will not only better understand yourself, but the metaphysical world in which you live. You can read more about Anna Maria Prezio here http://www.prezio.com/.